If there are problem in streaming the calls: right-click on wave link, save target as file on your computer, double left-click on saved file. The characteristics of the Honey Buzzard flight call are a very steep and short upstroke lasting only about 0.1 secs followed by a long shallow decline lasting from 0.5-1.0 secs with a frequent length of about 0.8 seconds. The decline can be at a constant rate when it appears as disyllabic or it can level out when it appears as trisyllabic. Sometimes the decline shows fluctuations when it appears as multisyllabic. At moderate range (see below), there is only one harmonic which starts at about 2.0kHz, rises to about 2.8kHz and then declines back to 2.0kHz. The call is weak on the upstroke, with maximum intensity at the top of the call and the first half of the descent. The intensity declines at the call's end. These calls were taken in the field in the range of 100-300m. They therefore represent how the birds sound to an observer in the field. 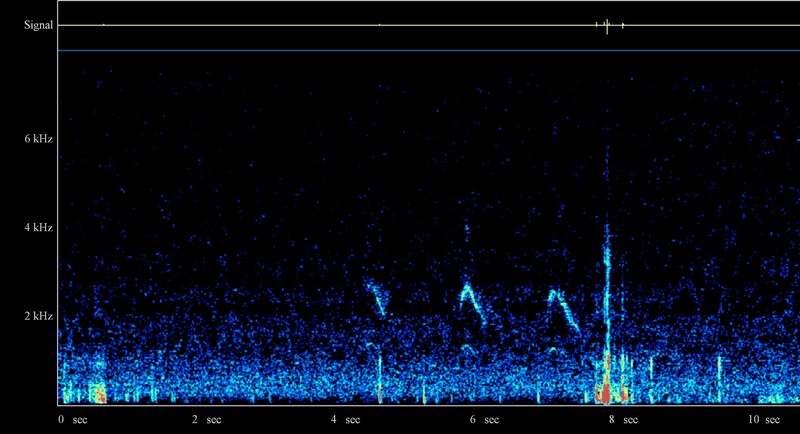 Calls taken at close range may show more harmonics. Honey Buzzard Pernis apivorus calls are thinner, sometimes comprising only one harmonic or, if more, one strong harmonic and two weaker ones. Jonsson (1992) notes the clearness of the Honey Buzzard call. The calls often have an inflexion near the end when instead of declining rapidly in pitch, there is a sharp break to a slower decline or even a plateau. Ferguson-Lees and Christie (2001) describe the long-drawn trisyllabic gleewheeeoo as distinctive from adult Buteos and the disyllabic glee-ah or glee-oo as not unlike young Common Buzzard. Overall the calls tend to be markedly asymmetric – a much longer downward side than an upward one. In Cramp (1980) the call is described as 'keee-er', 'slwee-er' or 'whEEoo', not very similar to call of adult B. buteo but closely resembles juvenile of this species at or just after fledging. Juvenile B. buteo lose their characteristic thin shrill timbre about December (Cramp, 1980). The sonogram shown in Cramp has only one strong and one weak harmonic as typically found in the present study. There is a strong similarity between the sonogram in Cramp and the disyllabic one obtained in Northumberland as converted here to a broader x-axis (similar time scale). Note the weak upstroke in the Northumberland call, relative to the downstroke. Common Buzzards show a stronger upstroke. Witherby et al (1939) describe the Honey Buzzard as a 'much more silent bird than [Common] Buzzard, though some pairs are rather more vocal than others. Ordinary note on wing is rendered 'püihü' and 'pihã' with variants, the more trisyllabic and higher-pitched version, being apparently that of male ...All these notes are more whistling and squeaky than [Common] Buzzard’s and in part more grating'. From the present study it is agreed that Honey Buzzards certainly call much less than the very vocal Common Buzzard, their calls are thinner and the transcriptions as 'püihü' and 'pihã' seem reasonable. However, the spectrograms show that the trisyllabic version is at the same frequency as the disyllabic one and both sexes seem to utter both lengths of calls. Honey Buzzard calls have been described as 'waderish' with Cramp (1980, p.15) saying 'Flight calls recall those of B. buteo but more plaintive and include characteristic trisyllabic melancholy whistle of male, recalling Grey Plover Pluvialis squatarola to some ears'. 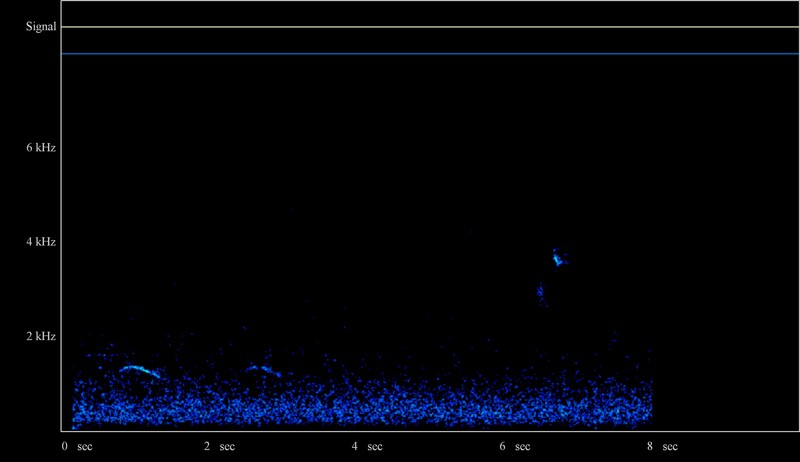 The sonogram for trisyllabic Honey Buzzard 7 June Northumberland can be compared to that for Grey Plover (Cramp, 1983). The pitch, duration, shape and restricted number of harmonics are similar but the Grey Plover's ending inflexion is upwards while that of the Honey Buzzard is typically gently downwards. A Swedish raptor group provide a video and flight calls at BIVRÅKEN I DALSLAND. A spectrogram, produced by NR, is available here. The calls are 0.8-1.0 seconds long and show a rise from 2.0kHz to 3.0kHz before declining back to 2.0kHz. 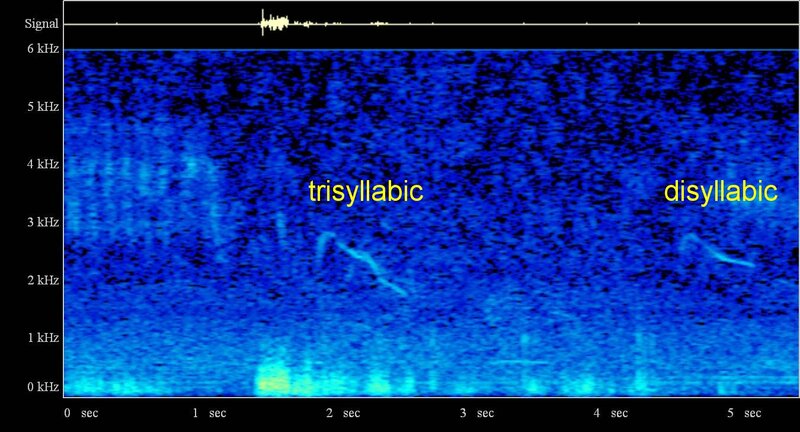 Of the total of four calls, three are basically disyllabic, the third is trisyllabic with the inflexion on the downstroke showing well in the spectrogram as found in the Northumberland trisyllabic calls. .The second Swedish call has a hint of an inflexion. The intensity of the calls is similar to those in Northumberland with a relatively weak upstroke. The main difference is that there is a very weak higher harmonic in the Swedish calls, presumably because the calls have been captured at a higher volume. This higher harmonic runs from 3kHz to 6kHz before declining to about 4.5kHz. This harmonic is so faint though that the call will still sound much like a single-note whistle. Common Buzzard Buteo buteo calls are richer with usually two strong harmonics and two to three weaker ones. The pitch of the calls declines rapidly at the end with less of an inflexion. The calls tend to rise and fall more symmetrically although the downward side is still longer than the upward one. The strongest harmonic in both Honey Buzzard and Common Buzzard calls is at a similar pitch in the 2-3 kHz range. A very interesting mimic of Common Buzzard calls is the Jay Garrulus glandarius, at least in mainland Europe. See for instance Collins Bird Guide (2001, p.332). This mimicry was recorded in Corsica in July 2003 with calls from within a roadside tree near a town. The calls were quite convincing and only, on close inspection of the tree, was the singer identified. The mimicry presumably acts as a deterrent to Goshawks, one of the Jay's chief predators. In conjunction with Duff's article in 2006 on how Honey Buzzard juveniles apparently mimic Common Buzzards to try and avoid predation by Goshawk, this builds up a picture of perhaps a number of species using Common Buzzard features to fend off the Goshawk. This mimicry by the Jay is not so common in Britain (is it known at all? ), perhaps reflecting events of the last few centuries when Goshawks became extinct in the area and such mimicry was not needed. The mimicking calls of the Jay are typically 1.0-1.2 secs long with the main harmonic peaking at 3.1 kHz and descending to 2.1kHz. There are a number of other much weaker harmonics at about 4.5-3.2kHz, 6.0-4.5kHz and 1.2-1.0kHz. The upstroke is very steep as in Common Buzzard but the descent is longer than in many adult Common Buzzard calls and there is a tremor or upswing at times towards the end. Indeed the Jay calls here are closer to those of Common Buzzard juveniles (see below) than to Common Buzzard adults. Allen, Northumberland, 7 June 2005, adult wave spectrogram Note multiple harmonics, shorter downstroke (more even to upstroke) and greater intensity throughout. Common Buzzard juvenile calls are perhaps more likely to be confused with Honey Buzzard calls than those of adult Common Buzzards. In particular the upstroke is weaker with the main emphasis on the long downstroke. In addition there is a clear quavering in the middle of the downstroke which might be interpreted as a trisyllabic Honey Buzzard call. However, the inflexion in the Honey Buzzard call occurs at the end of a straight-line descent in pitch whereas in the Common Buzzard juvenile the quavering runs right through the long descent. In some calls the quavering is so pronounced that there is a distinct second peak which is almost as high as the first peak. While juvenile Common Buzzard calls sound slightly thinner than those of adult Common Buzzard, the calls typically have four harmonics and hence have less of a whistled character than Honey Buzzard calls which at most have three harmonics (one strong, two weak). The exact number of harmonics recorded varies to some extent with the distance. 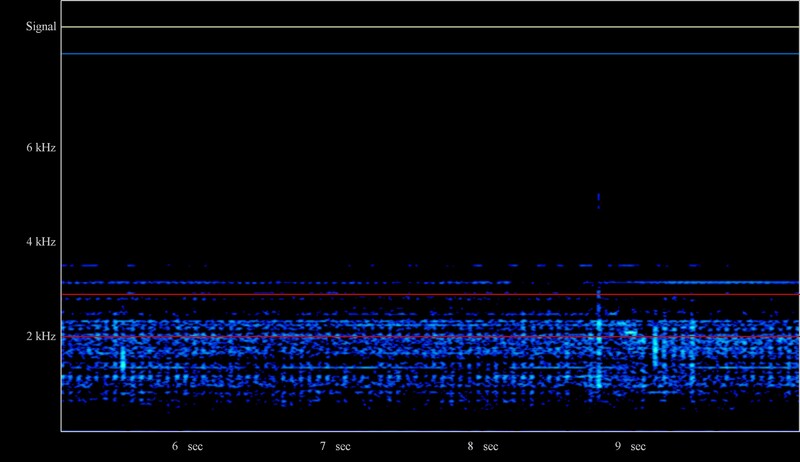 Typical thin plaintive flight call, 0.9 seconds long, peaks at 2.9kHz, declines to 2.1kHz with very slight inflexion. This call is basically disyllabic but with a long downward section and, as usual, emphasis on the downstroke. Also see video taken at this site at the same time. Wave 1 (female) shows two typical disyllabic calls with weak upstroke, pronounced descent and one harmonic. Wave 2 is recorded at a relatively short distance of c50m from female but much further from the male. The first six calls are from the female, the last, which is much fainter, from the male. 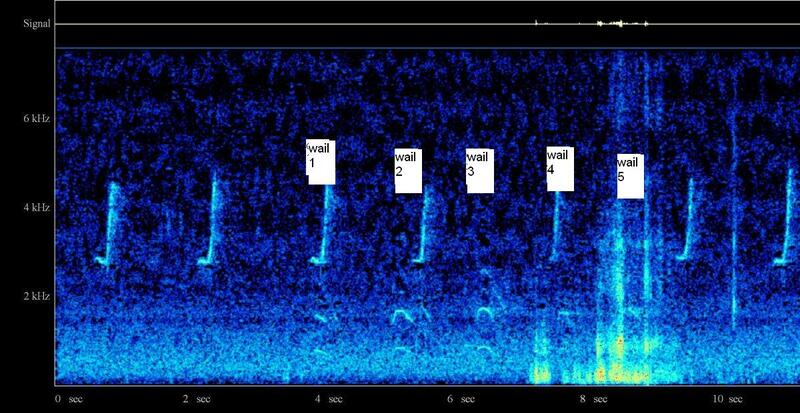 The spectrogram shows the six calls from the female are: disyllabic, trisyllabic, disyllabic, disyllabic, disyllabic and multisyllabic, respectively. The male call is disyllabic. The closer recording distance for the female has increased the apparent number of harmonics to three with echoes in the 3-4 kHz range and around 1 kHz. These calls follow the shape and intensity of the main harmonic, except that the lower one is flatter and both diminish more rapidly than the main harmonic on the downward side. The call is obviously stronger at the shorter distance but the weak upstroke and thin effect are maintained. Typical thin plaintive flight calls. 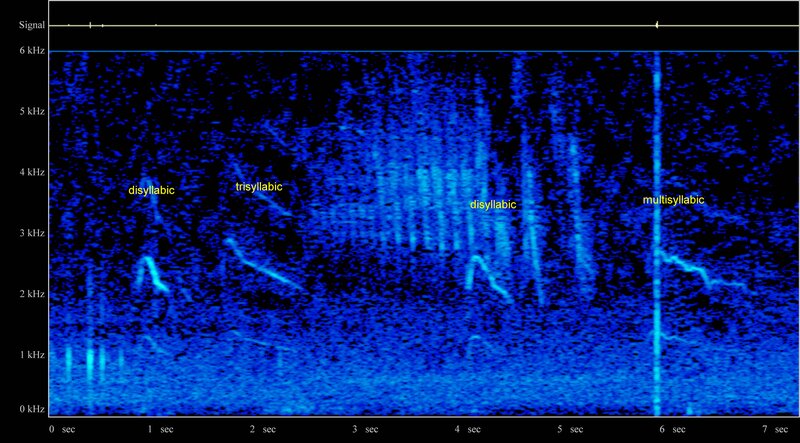 The spectrogram for the weak disyllabic call shows a very weak upstroke while that for the stronger disyllabic call shows one strong and one weak harmonic. The strength of the call varies with the mood of the bird to some extent. This is from video 2006-105a at 32 seconds. The call was heard at some range but the thinness and plaintive tone are very typical for the species. The call is apparently 0.4 seconds long but was probably actually longer with the end not being recorded. The call peaks at 3.0 kHz and tails off to 2.8kHz. Allen, Northumberland, 14 May 2006, trisyllabic long flight call in display by presumed female. Different site to that above. This is from video 2006-100b. 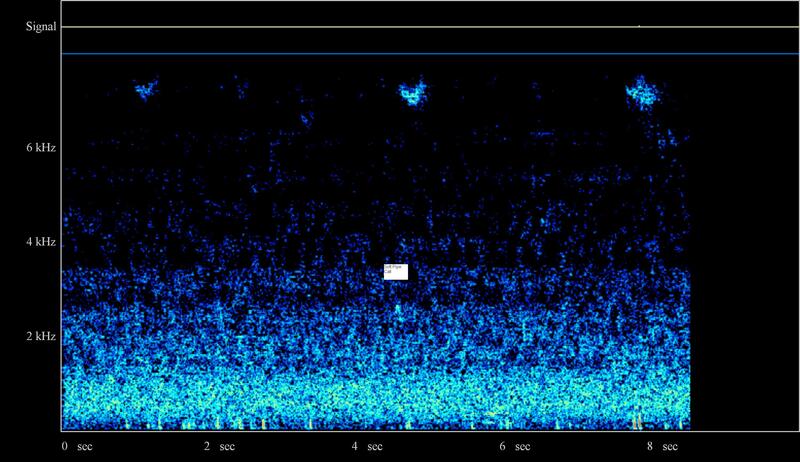 In the extract the call is from 9 -10 seconds on the spectrogram. 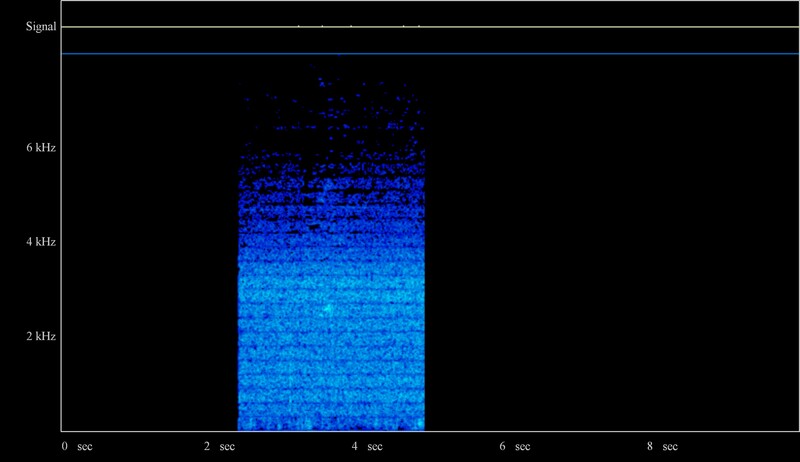 The call is trisyllabic 0.44 seconds long (perhaps longer in reality with high background noise), weak upstroke not recorded, peaking at 2.8kHz, then falling to 2.2kHz with a long plateau at the end giving the trisyllabic feel. 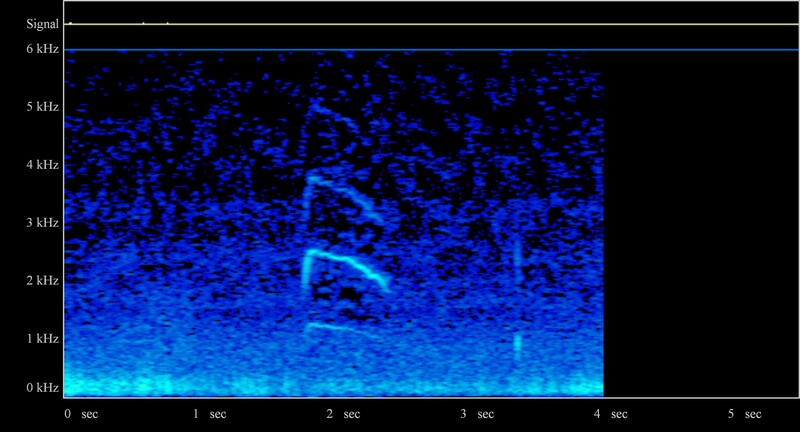 In extract from video 116e at 8 seconds on spectrogram (length 0.31 seconds) and 15 seconds (length 0.35 seconds) mark, both disyllabic with 2.8 kHz maximum and long decline to 2.0 kHz. 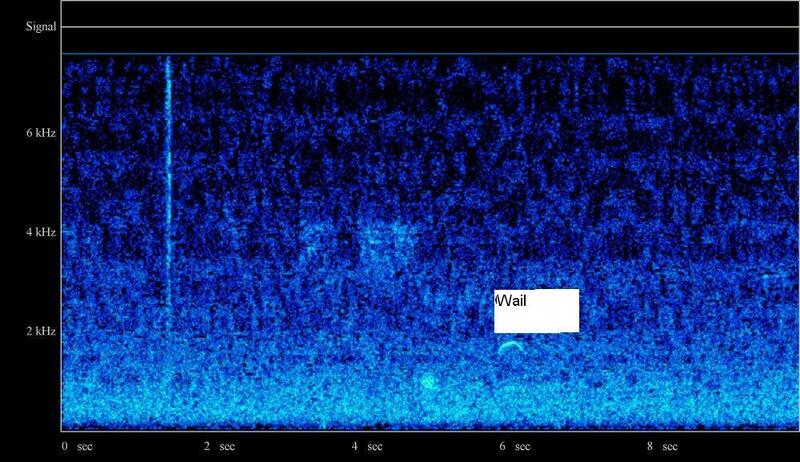 See wma and spectrogram . Both calls may be longer in reality. In extract from video 116f at 4 seconds on spectrogram (length 0.60 seconds) with fainter call on spectrogram two seconds later. Disyllabic with 2.8 kHz maximum and long decline to 2.1 kHz. Maximum intensity at top and just after top. 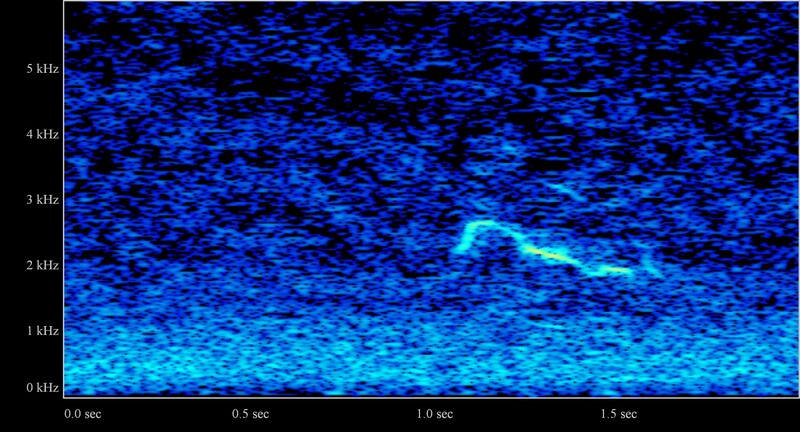 See wma and spectrogram . 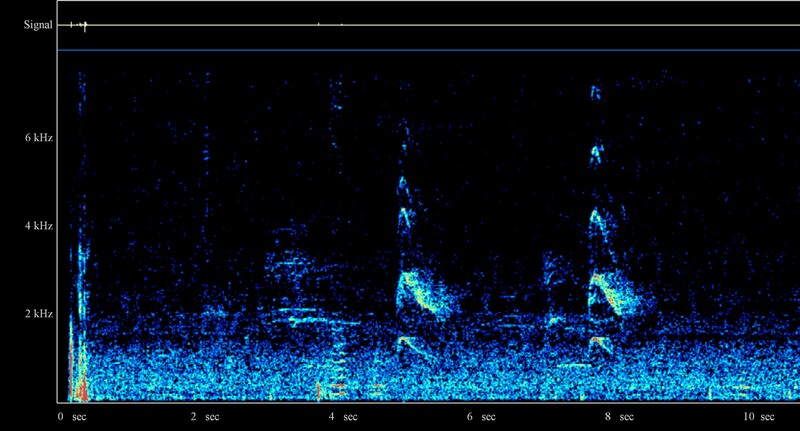 Four long flight calls may be heard in the extract from video 210b at 7, 13, 27 and 35 seconds on the spectrogram. The disyllabic third call is the clearest and is 0.8 seconds long with a rise from 2.0kHz to 2.6kHz before a long descent to 2.0kHz again. Only the third call has been used in the statistics below. The upstroke and top are relatively weak. 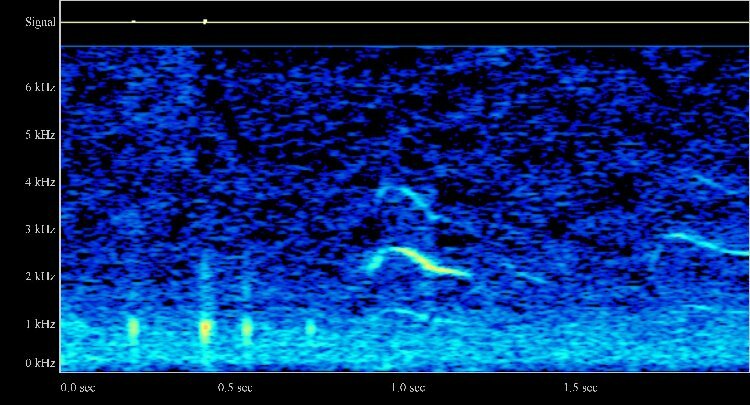 See wma and spectrogram . South Tyne, Northumberland, 21 September 2003, calls of departing juvenile (see photographs on Stills page) getting fainter through series as bird ascends. Each call lasts about 0.8 seconds, the same as for adults. The main element is in the 2-2.5 kHz range. 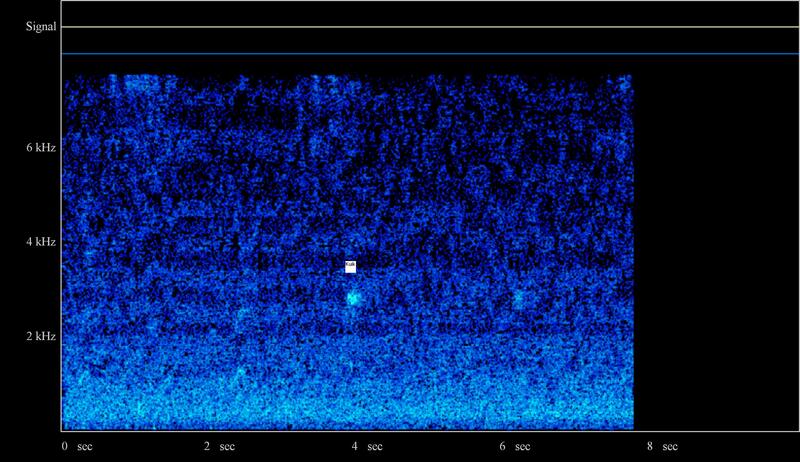 The first spectrogram shows one disyllabic call with a fainter higher line as well at c4 kHz. This spectrogram also shows a trisyllabic call at 2-2.5 kHz. 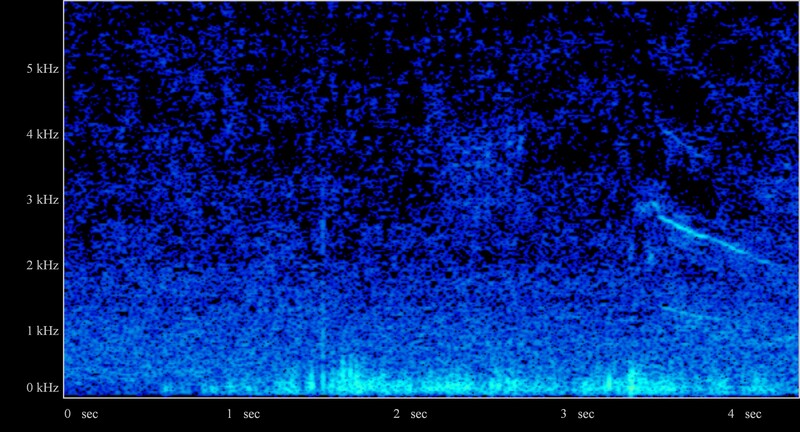 Overall the calls are rather like the adults but even thinner as shown on the second spectrogram where only one element is found (2-2.5 kHz). The third and fourth spectrograms show a weak upstroke. Witherby et al (1939) note that juveniles 'after fledging [make a ] note much like that of adults, though rather thinner'. 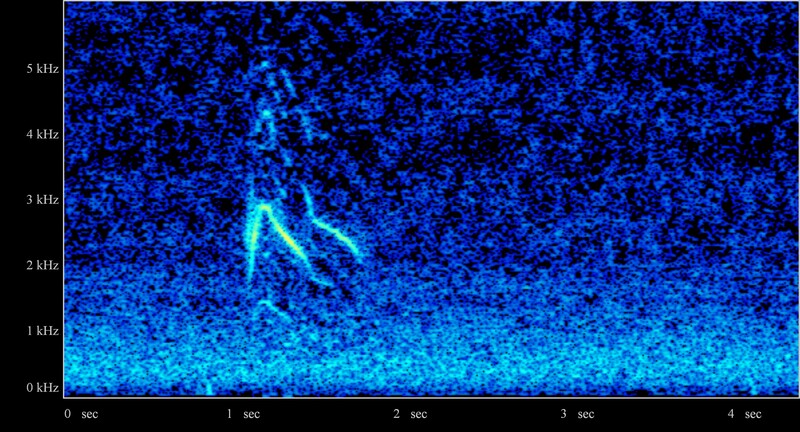 See also compressed audio spectrogram from video for South Tyne, 21 September 2005 where call appears very thin, lasts for about 0.7 seconds and descends from 2.9-2.2 kHz with an inflexion at end. It therefore appears to be trisyllabic although the weak upstroke has not been recorded. Only one faint call, lasting about 0.4 seconds, was recorded in the six-minute soar. This is in the range 2.1-2.4 kHz. The call is not strong enough for more detailed analysis. These anger calls are given during some site visits when the birds became anxious. They are given at a small minority of sites, most birds making much softer calls, if any, during an inspection (see single soft pipe call below). 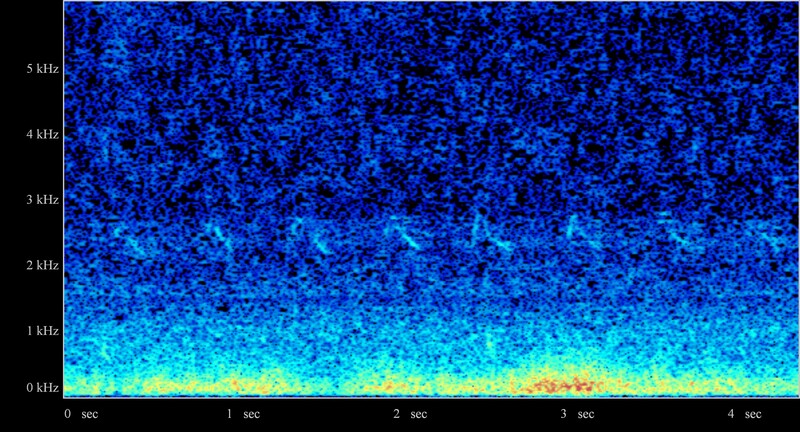 These calls are similar to the flight calls in general appearance on the spectrograms. The weak, short upstroke is again obvious and the intensity is typically strongest at the peak and on the downstroke. Their pitch is similar on the main harmonic, starting at 2.0-2.2kHz, rising to 2.6-3.2kHz and then falling back to 2.0-2.2kHz. However there are some clear differences: the length of the call is in general shorter being in the range 0.35-0.65 secs (average 0.55 seconds for the 15 calls above). 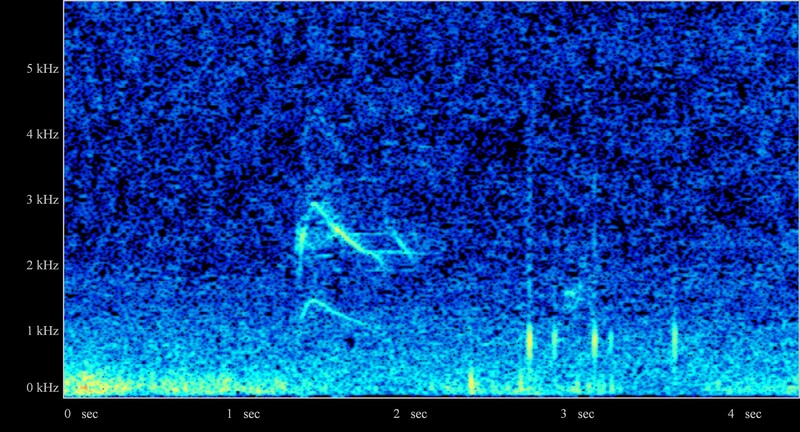 The most obvious difference is the extra harmonics, although some of these may arise simply through the birds being closer, at about 50 metres in the 11 July 2005 recordings and 20-25 metres in the 10 July 2006 recording. Indeed the longer distance in the 22 July 2004 recordings shows one main harmonic. 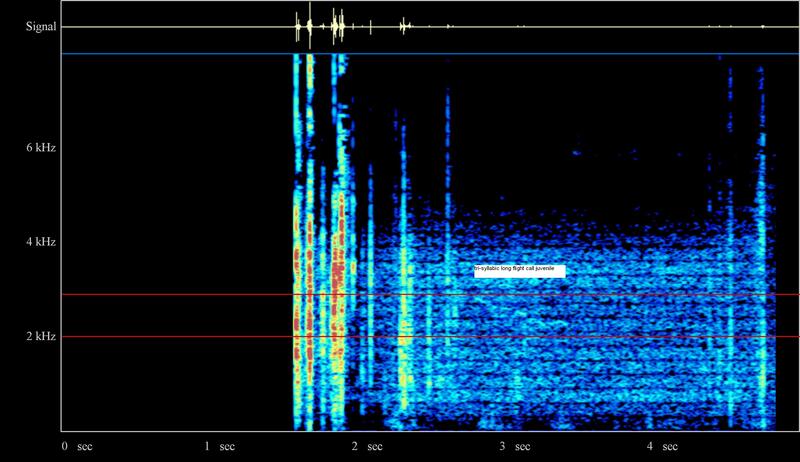 In the close-up recordings, extra harmonics appear at peaks of 1.6-1.7kHz (lower than main one), 4.5kH-5.3kHz, 6.0kHz and 7.5kHz. These extra harmonics are characterised by being shorter at about 0.2 seconds and more symmetrical and disyllabic with intense upstroke and downstroke. The overall effect is a shrill, rather forced call, still sounding rather thin but with considerable volume at the top of the upstroke and during parts of the downstroke. Analysis of the 15 calls on 10 July 2006 shows that six are most intense on the downstroke, six are most intense at the highest pitch and on the downstroke, four are fairly even in intensity throughout the call and one is strongest on the upstroke. Varying emotion may account for these differences. 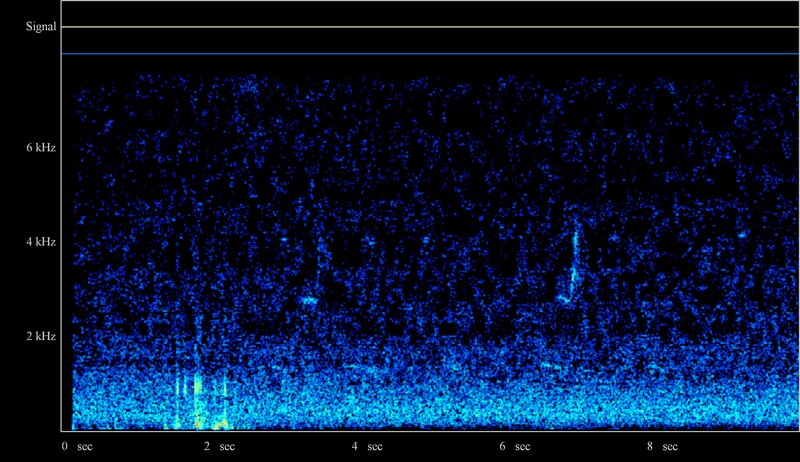 The spectrograms for the main harmonic for these calls (2.2-3.2-2.2kHz) suggest that 11 are trisyllabic, two are disyllabic and two are multisyllabic. The main harmonic may therefore appear to be trisyllabic at close range but the other harmonics are disyllabic suggesting a weird effect on the listener. The RSPB provide calls, perhaps produced at a falconry centre with attendant sparrows, at Honey Buzzard. A spectrogram, produced by NR, is available here. The calls are extremely loud and will not be heard like this in the field. The main harmonic starts at 2.2kHz, rises to 2.8kHz and returns to 2.2kHz. The call is about 0.35 seconds in length. There are additional harmonics at about 5kHz and 7kHz. The calls are disyllabic and the upstroke is relatively strong as found in the higher harmonics in the present study. These are not flight calls: they are too short, are disyllabic and have a relatively strong upstroke. Witherby et al (1939) mention “a screaming, owl-like 'pichuh' ('ch' guttural) when alarmed (E. Hesse)” which could well be this call. The alarm calls are short, like the 'pya' given in Cramp (1980, p.21). 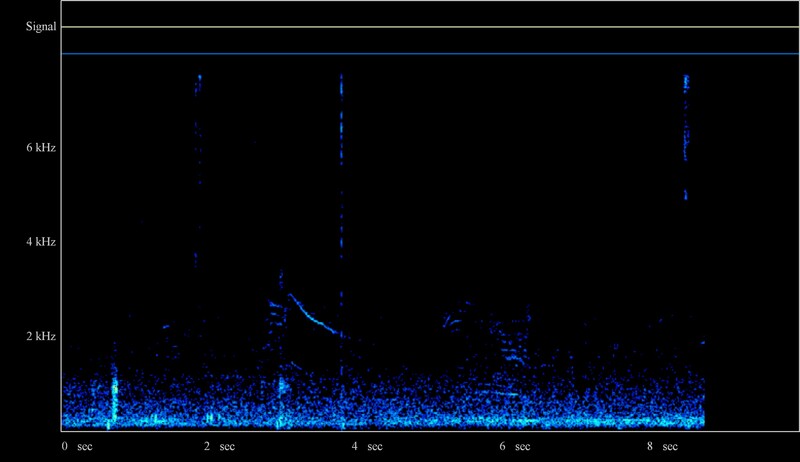 Spectrograms are given for the alarm calls and the trisyllabic call. The former shows 8 short calls in just over 4 seconds, each rising and falling quickly at a central pitch around 2.6 kHz with a range of 2.2-3.0kHz. The call is stronger on the downstroke. Each call lasts 0.20-0.25 seconds as against the 0.8 seconds for the trisyllabic call which shows the normal shape. Disyllabic calls can be shorter at around 0.5 seconds. Two short whistles (about 0.25 seconds each) are made in the range 2.0-2.2kHz. There is about 0.4 seconds between the calls. Each call comprises only one harmonic. A very short version of the flight and alarm calls given when the birds are anxious near their nest. Each call lasts for c0.05 seconds and is given at a very similar frequency to the flight call of 2.5-2.8kHz. 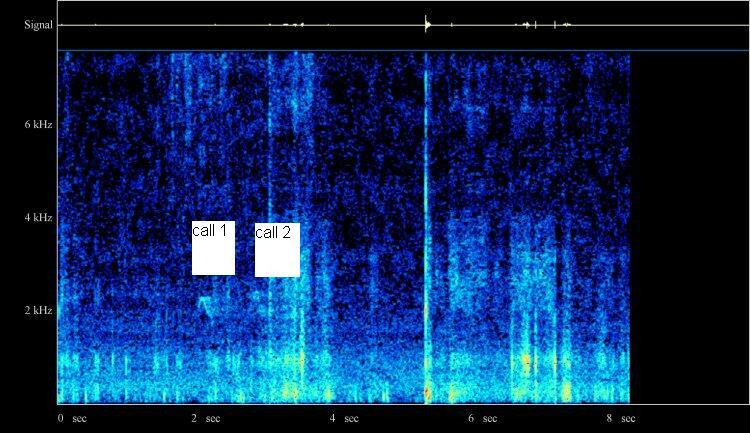 When looked at in detail the call is fairly flat (sometimes with a slight rise and fall of about 0.2kHz) containing two harmonics very close to each other and of uniform strength. The call is termed 'guik' in Cramp (1980, p.21). 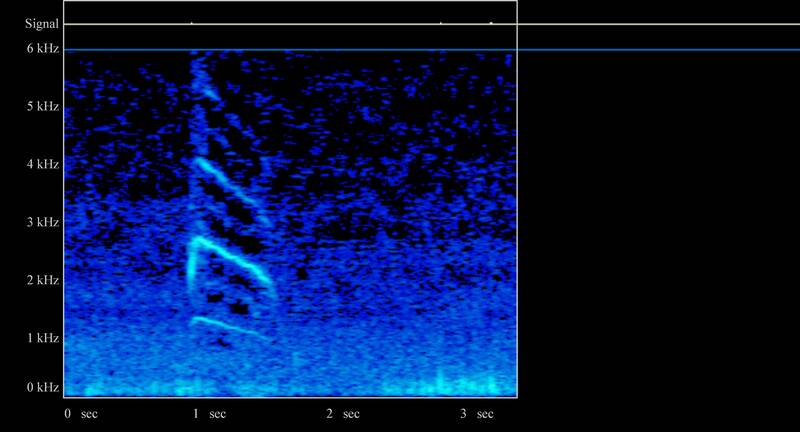 It is similar in pitch to the 'kuik' of the Tawny Owl Strix aluco but is less explosive at the start (hence 'g...' rather than 'k...') and shorter than the c0.20 seconds of the Tawny Owl call. The Honey Buzzard call also appears to be faster with 6 in 3.5 seconds and 4 in 2 seconds giving a rate of about 2 per second. It should be noted that Ferguson-Lees & Christie (2001, p.340) do consider the call to be 'kuick', resembling Tawny Owl. A call heard near nest sites, often associated with anxiety, perhaps during a nest visit or when one of the adults is mobbed. The call is made at a pitch of 2.6kHz, lasts about 0.10-0.20 secs, is at a fairly uniform volume and is monosyllabic with very little variation in pitch. It is heard as a pure, soft short piping call, perhaps not unlike that of Bullfinch Pyrrhula pyrrhula. Witherby et al (1939) mention a monosyllabic call:: “while the disyllabic form may be shortened to a drawn-out monosyllabic more like 'quih' ” which resembles this single short pipe call. 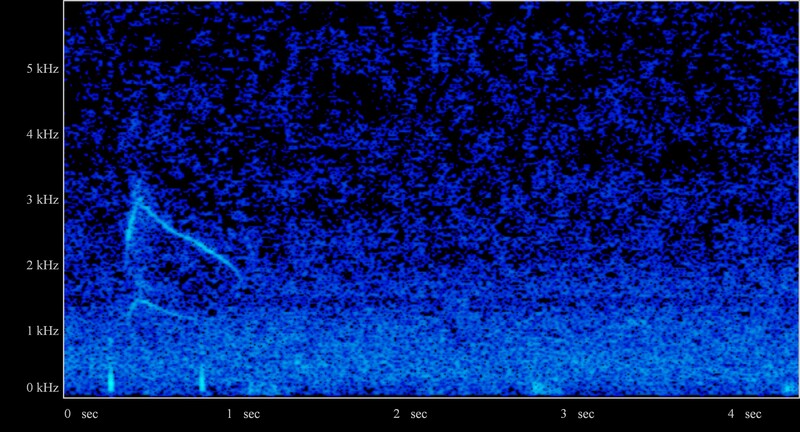 Hexhamshire 19 May 2005, while being mobbed in flight by Carrion Crow compressed audio spectrogram . This call was recorded during the video 2005-0 as shown on the Videos page. Hexhamshire 4 July 2005, adult floating back towards presumed nest site compressed wma jpeg (9 seconds point). 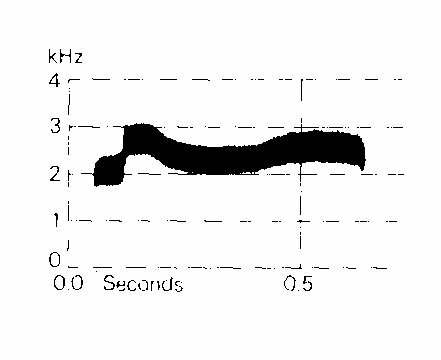 The soft pipe call is thin (one harmonic), fairly flat in the range 2.1-2.3kHz (lower than some) and lasts about 0.2 seconds. Video 2005-14 on the Videos page. A sequence lasting in all from 2.5-5 seconds of four to five mournful wailing calls given at a variable pace. A single call variant is also heard. Each call has two harmonics – hence the call is still rather thin but not as thin as the flight call. Both harmonics are deeper than the flight call, the lower one much lower at around 0.8-0.9 kHz and virtually flat, the higher one only slightly lower and rising and falling in the range from 1.5-1.8 kHz to 2.0-2.3 kHz. Each call lasts for 0.3-0.4 seconds. Unlike the flight call, this call is also strong on the upstroke. The calls are far-carrying and can be heard at 500m from the nest but appear to be used much less than the flight call. The sequence of calls is given when a bird approaches the nest. The single call version appears to be used as a contact call in the vicinity of the nest site. These calls might be described as pyow which is indeed described by Cramp (1980, p.21) as being given by a bird approaching the nest. The prefix by p is apposite owing to the strong upstroke. Witherby et al (1939) say that a “bird arriving at nest uses note like “pyow” or “pyã” rather suggesting spitting of cat; to which sitting bird answered with rapidly repeated 'teckõõ---', 'teckõõ---' or 'tecke---' [call]”. The pyow is presumably the wailing call described here and the teck is the ticking call described below. Witherby et al (1939 ) also describe “a melodious double note of male mentioned by K. Gentz, though the rendering 'trõõlüüh' might represent Hesse’s 'püihü' or variant, would appear to be distinct, being described as having some resemblance to Curlew, though much softer and more muffled”. Although not certain this double note might well be another representation of the pyow call which is relatively soft and muffled. 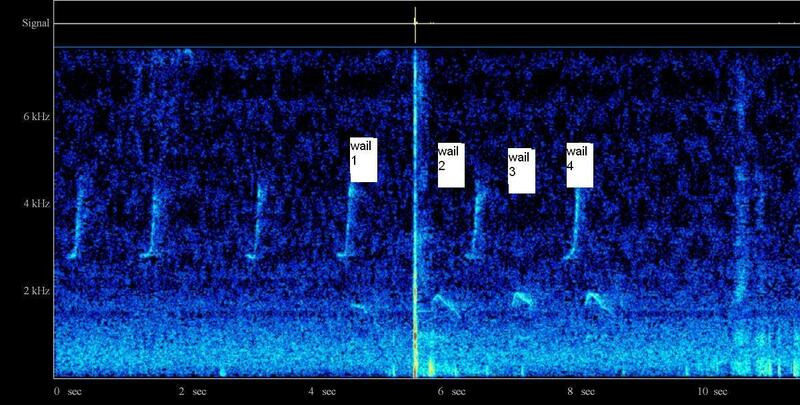 Four sequences of calls are given below in wave and spectrogram form. The first two are from one site (that with photographs for 1st and 2nd May 2004) and the last two from another (that with the alarm calls recorded on the same day). The stronger variants of the call resemble Peacock Pavo crisatus to some extent in their jungle wailing tone but are shorter and simpler, lacking the weird tones of the Peacock. For comparison some Peacock calls were obtained from ilovewaves . 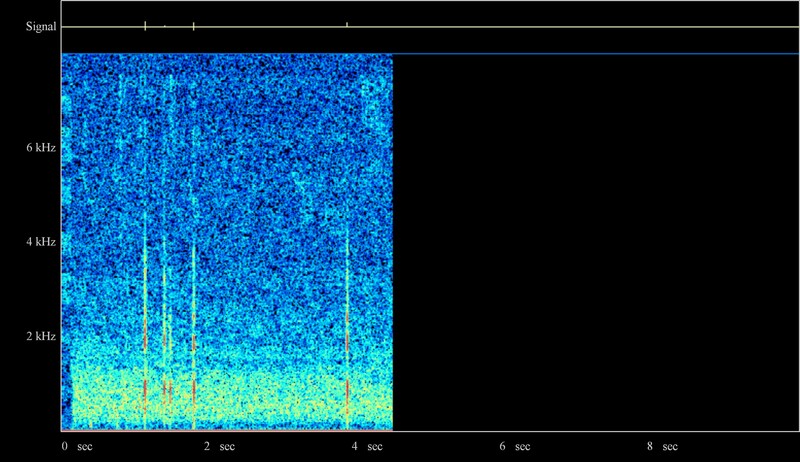 A spectrogram is shown here .The spectrogram shows a series of calls (7 in 9 seconds), each one basically the same with main harmonics at 0.7, 1.4, 2.0, 2.8, 3.5, 4.0 kHz and higher. Each element is about 0.7 seconds long. Compared to the Honey Buzzard wailing calls above, each element is about twice as long (0.7 seconds as against 0.3-0.4 seconds), there are more harmonics and, more subtly, the bottom two harmonics show a stronger downstroke while the hugher harmonics show a stronger upstroke. In the study area in the South Tyne, some distant (c200m) Peacock calls were recorded. These are available here in wave and spectrogram formats. The calls sound like Peacock with their long elements and weird harmonics. 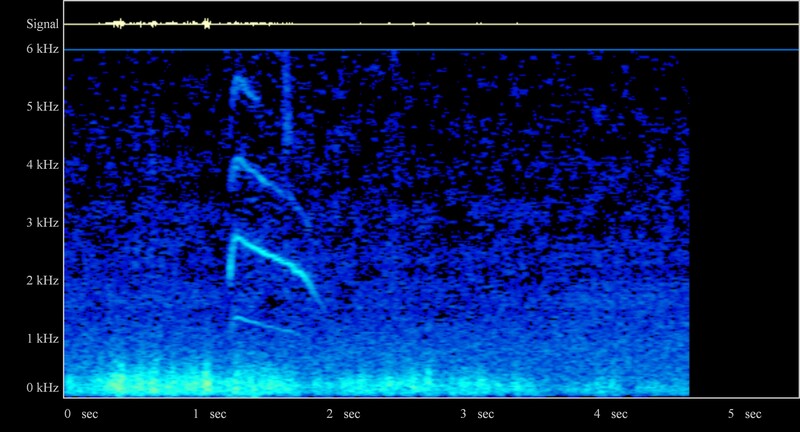 More objectively the spectrogram shows a long element (c0.7 seconds), stronger upstroke at 2.0 kHz and above and stronger downstroke below 2.0 kHz, in accordance with Peacock calls. The distant calls show fewer harmonics than expected for Peacock and in particular the lowest one is not visible. However, the number of harmonics recorded depends very much on distance. Further calls were obtained in 2005:. Allen 7 June 2005:. The calls were given from the trees where the birds went onto nest. It is presumed the calls were associated with nest building and/or mating. 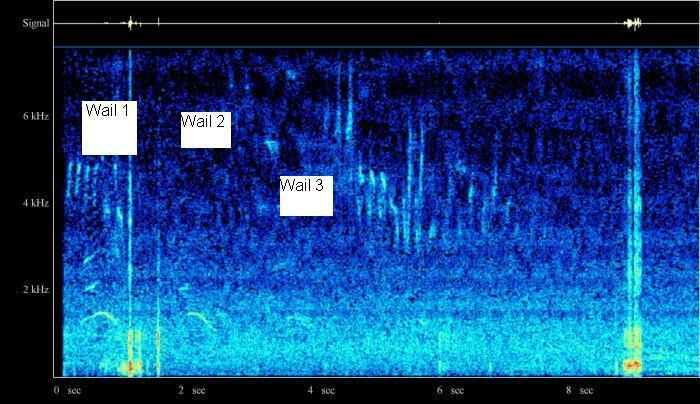 The calls recorded this day are similar in sound to the wailing calls recorded earlier but are subtly different,on the spectrogram. The greater distance to the birds in the 2005 case is likely to have caused only one harmonic to be noted, with the lower weaker one omitted. The frequency is slightly below the higher one noted in 2004. The rate of delivery at one element per second is similar to that noted earlier but the individual elements lasted up to 0.6 seconds, significantly longer than noted in 2004. A call which is evidently restricted to the close vicinity of the nest and reputedly given by the male (Cramp 1983, p.20). It appears to be used as an alarm, or at least an anxious reaction, to intrusion on the nest site. Ferguson-Lees & Christie (2001, p.340) report the call as a rapid exciting ticking at nest relief. The call is far less far carrying than the various whistled calls enabling inconspicuous communication between the pair. The call has been likened to the noise made by a piece of cardboard inserted into the spokes of a moving bicycle wheel or perhaps more accurately in this case to a rapid popping. The spectrogram shows that in full flow the ticking is fast at 10-12 calls per second. 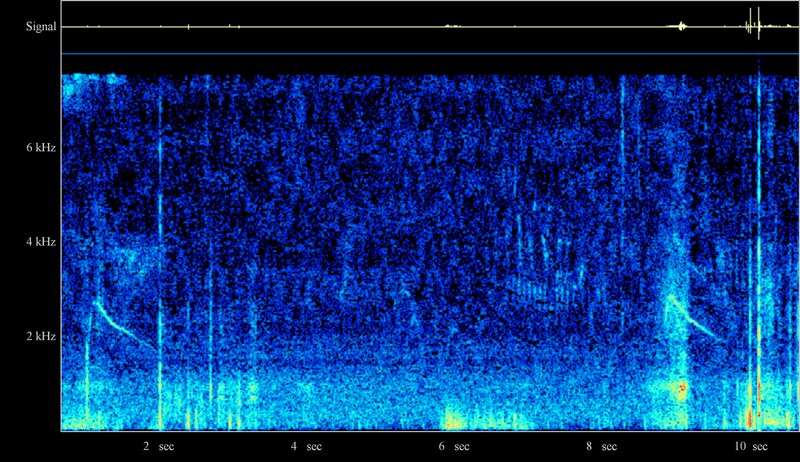 The pitch is at 0-2 kHz for the first calls in this recording with a weakening in some cases around 1.6kHz. Some of the later calls show a much wider pitch from 0-8 kHz but with a weakening from 2-4 kHz. A comparison can be made with a sonogram for the ticking call in Cramp (1983, p.21). 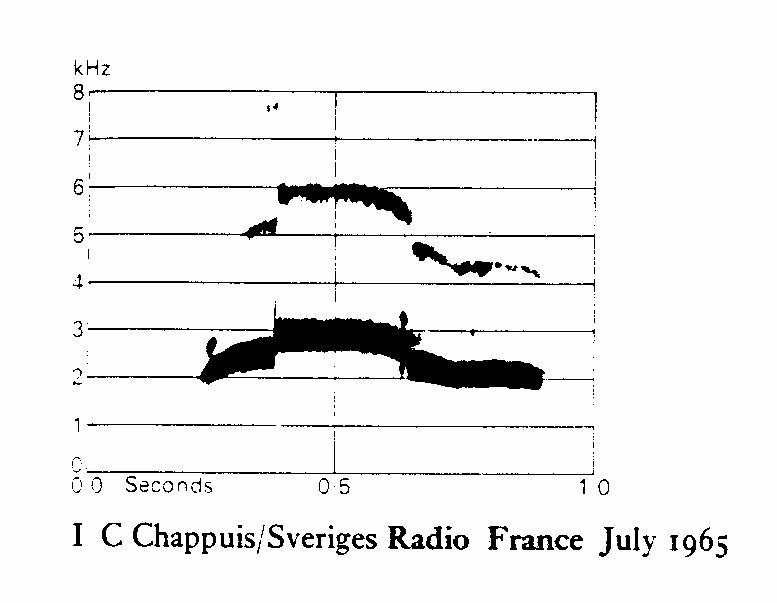 This shows a lower frequency of 0.5-2.5 kHz and a higher frequency of 4.5-6.5+ kHz with a gap in between as found in the present study in the calls near the end of the sequence. The rate in Cramp is 10 per second, very close to that in the current study. Witherby et al (1939) describe this ticking call thus: 'rapidly repeated note mentioned by Hesse is presumably same as that (rendered “teck”) described by O. Heinroth as very different from those of other raptors and recalling loud, hard, prolonged version of Black Redstart’s scold or still more, a distant motor-bicycle!'. They also describe the ticking call in conjunction with the wailing call: “bird arriving at nest used note like 'pyow' or 'pyã' rather suggesting spitting of cat; to which sitting bird answered with rapidly repeated 'teckõõ---', 'teckõõ---' or 'tecke---' [call]”. The alarm, owl and wailing calls were recorded at distances of 100m-500m from the nest as an incidental part of the monitoring programme. The ticking calls were recorded at 30m with the microphone directly aimed at the bird sitting tight on the nest, in a routine visit to the sites. A series of recordings were made with alternations between one with the microphone pointed at the nest and one with the microphone pointed completely away from the nest. In a series of five recordings made this way, the ticking was evident on each one with the microphone pointed at the nest and on none with the microphone pointed away from the nest. Different site to that above. The microphone was pointed at the nest where the bird was sitting tight. 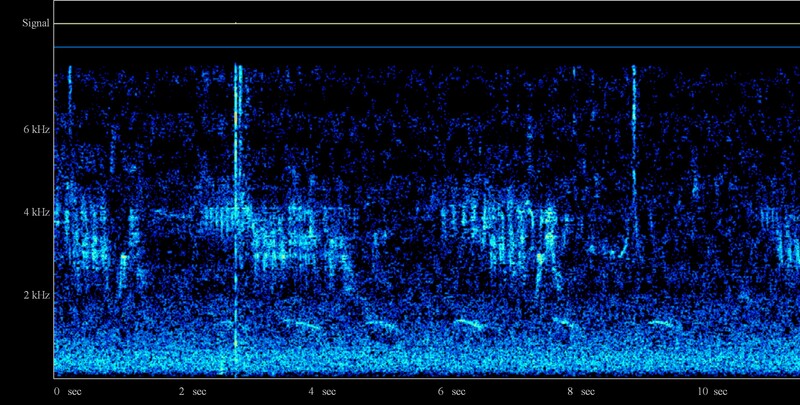 The calls show a pitch from 0-4kHz with a weakening around 1.6kHz, similar to the first calls in the recording above but with a wider range up to 4kHz instead of 2kHz. A monotonous call given from the top of the canopy by freshly-fledged juveniles, which is evidently a begging call to attract food from the adults. It may also serve as a contact call within the wood: the call is not loud but can be heard at say 50m by the human ear. The call sounds rather like that of a chicken and, in agreement with this, a Danish recording suggests the food call of the Honey Buzzard is rather like the call of the domestic hen Gallus. Previous workers have indicated that broods in the nest are completely silent (Cramp 1983, p.21) so the Danish call may also refer to the freshly-fledged period. Also in BWP a rather explosive, rapidly repeated call 'plik, plik, plik', lower in pitch than the food call is described by P.J. Sellar (ibid). A shorter, deeper and more abrupt form of the chicken call has also been found in the current study but it was not rapidly repeated. This call may warrant splitting from the begging call as an anxiety call, as it was made on my approaching closer. 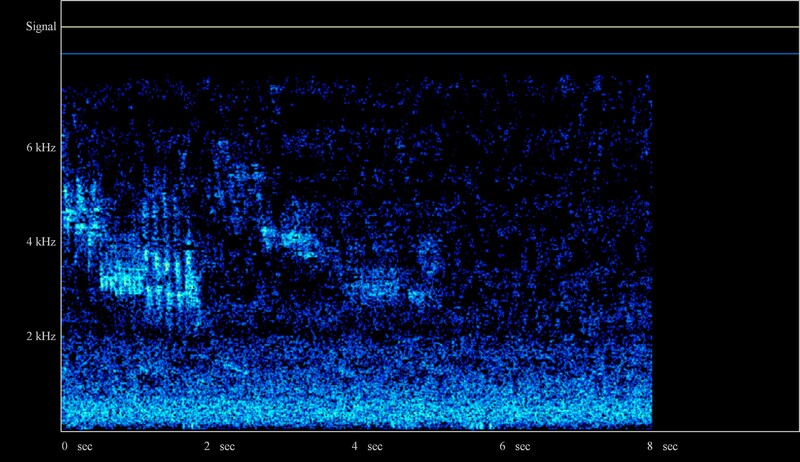 The spectrogram shows the calls are repeated at 4-6 second intervals, lasting about 0.4 seconds for the long version and 0.2 for the shorter. The pitch is mainly in the familiar 2.0-2.6kHz range over two main harmonics in the long form. In the short form there is an additional strong harmonic around 1.0kHz. In both variants the harmonics are fairly flat and the emphasis is on the first half of the call in the lower harmonic. These calls were also heard in nest visits in 2007 in August. The only call mentioned by Witherby et al (1939) and not apparently covered in the present study is a “food-call of nestlings rendered 'dee-dee-dee' (Heinroth)”. A summary of the nine types of call found in the present study is given in the table below. Clearly this is very much a provisional view with much material still to analyse. A medley of calls contained on these pages is available at Medley of Calls from Northumberland 2004-5 . The calls in the medley in order are anger, flight, alarm, wailing and ticking.. Typically 4-6 elements given in a sequence at a rate of 1/sec. A more explosive call with its stronger upstroke. 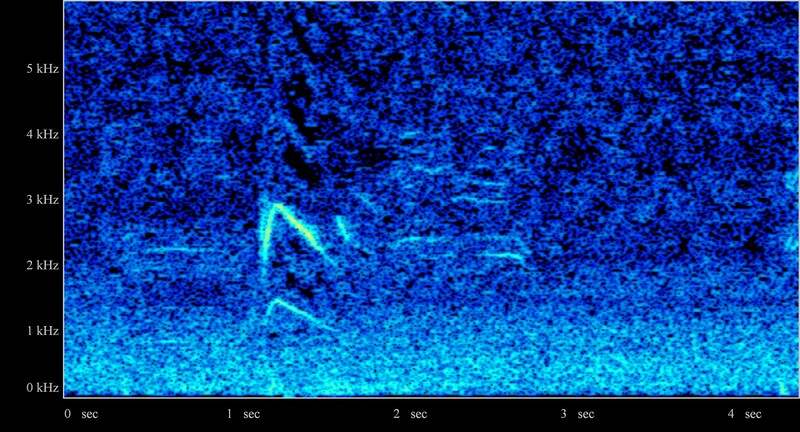 In many respects the Honey Buzzard acts in its calls like a bird of deep forest, with clear calls (few harmonics) at a pitch of around 2.5kHz. 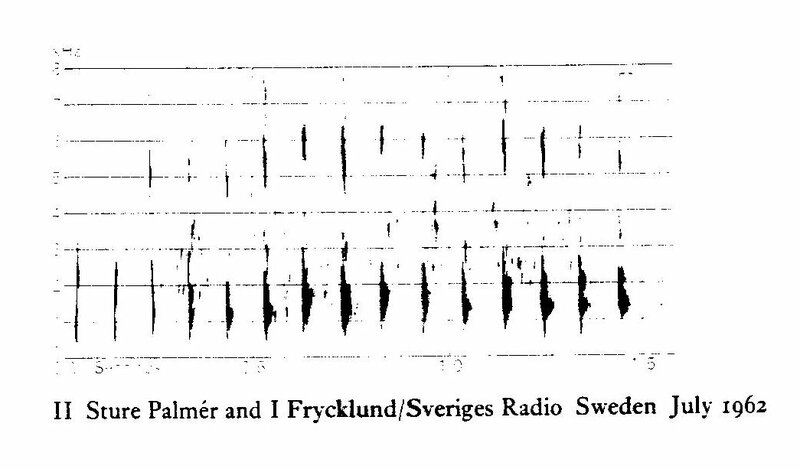 This characterisation of forest birds comes from Catchpole (1979, p.51) who noted, from work by Morton in 1975, that in general the comparatively narrow frequency range of 1.5-2.5kHz slowed less attenuation, that is less tendency to fade. He then examined the frequency ranges of forest birds and found that the average frequency used was within this narrow window at 2.2kHz. The song of forest birds also contained more pure tones, so concentrating the sound energy within the narrow range for effective propagation. The flight, anger, alarm, owl and single pipe calls have a central pitch around 2.5kHz. 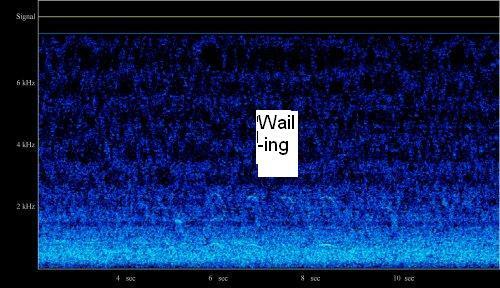 The wailing calls are the deepest calls in terms of pitch. Their higher harmonic varies significantly from well within the lower forest limit to just below it, being in the range 1.2-2.0 kHz.. Their lower harmonic, when found, at around 0.9kHz is well below the lower forest limit. A comparison of the Honey Buzzard and Common Buzzard calls in the present study with those reported and analysed by Simon Elliott (2005) has been made, which shows close agreement on three calls and possible disagreement on one.